As summer winds down, and the cooler, crisper winds of autumn roll in, transforming your outdoor space is an exciting way to celebrate the coming season. As with all décor shifts, finding a balance between simplicity and personalization is the key to creating a welcoming area that is both warm and practical for the coming months. In the fall, it’s all about comforting textures, warm color palettes, and cozy accents to heighten the stunning energy of the harvest season. When designing your outdoor seating area—a wonderful place to reflect nature’s transitions—consider these simple tricks to transform your outdoor space with some autumnal aesthetics. 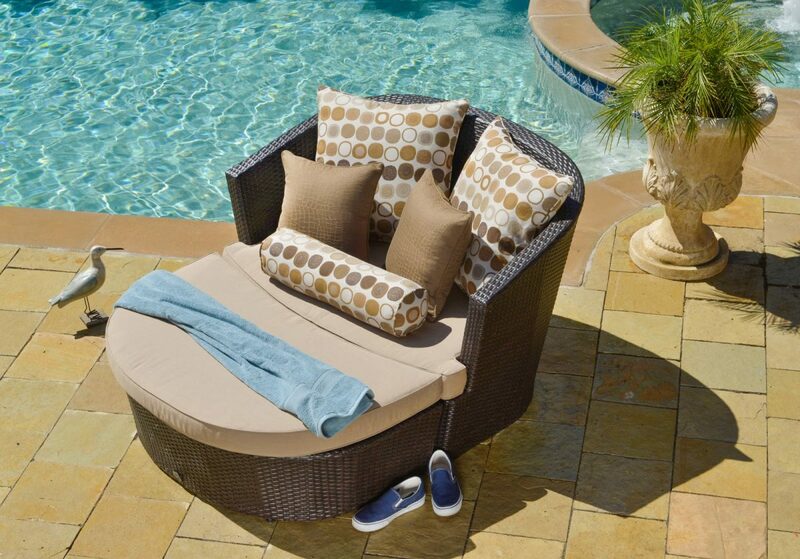 Outdoor accessories and patio furniture choices should mirror the warmth of fall. Transition your décor, pillows and natural accents from the light, pale tones of summer to reflect the rich earth tones appearing around you. Oranges, deep greens and tans will complement the surrounding foliage, and layered patterns such as thick stripes add depth to your design. Consider thickly knitted throws or textured pillows to add warmth to the patio furniture, and balance the space with seat cushions or braided rugs. For a more rustic appeal, consider a paler earth-toned palette of soft whites and grays with touches or pops of a favorite color such as deep purple or brick red. Exposed materials such as distressed wood or brassy metals accent the environment, making way for natural items such as seasonal flowers and plants. 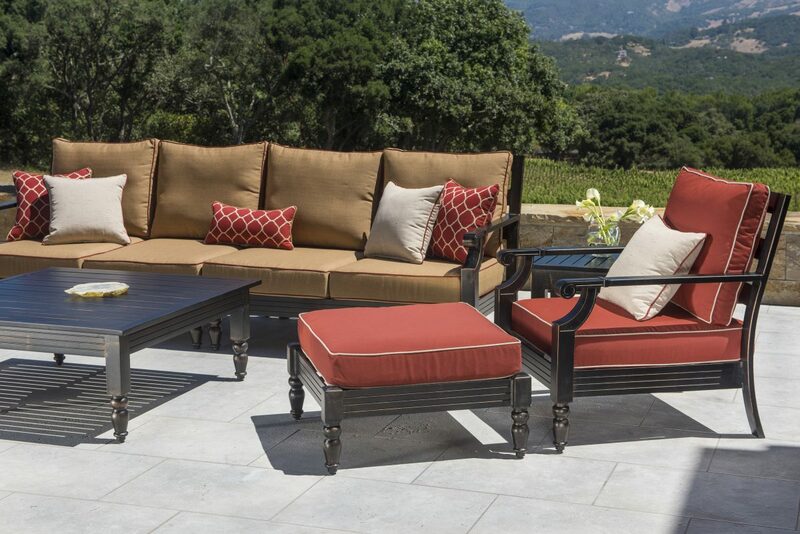 To enhance your luxury outdoor furniture, provide each piece with an accent item to draw attention to its charm, such as a homemade fall centerpiece, touches of natural lighting, or bunches of harvest vegetation such as pumpkins, pinecones, and woven branches. 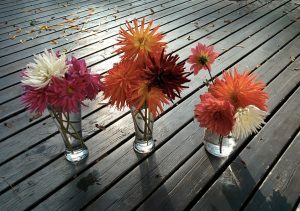 Since autumn celebrates the vibrant changes all around, seamlessly working them into fall décor is exciting and simple. 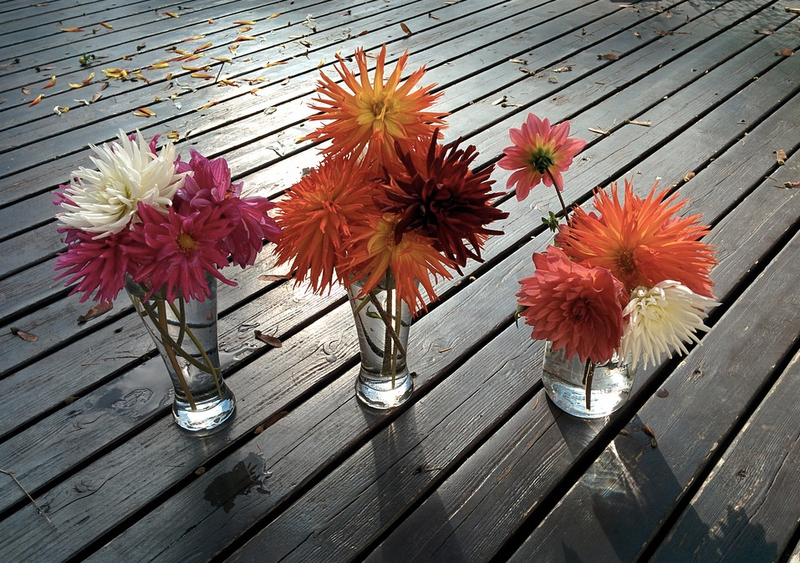 Choose local, seasonal planted selections such as mums or dahlias, and accent patio sets with plaid runners or rustic centerpieces. Unique and creative arrangements can be assembled in endless varieties of combinations, incorporating personal design and preferred craft style. It’s also not too early for wreaths. Utilize the fall leaves, ivies and selection of seasonal fruits such as cranberry garlands. These can be bulked up with tufts of hay, dried sunflowers, and even textured ribbons to reflect the colors in your space. Vibrant wreaths can be used as centerpieces—perhaps with a tall scented pillar candle in the center—or right on the door with a welcoming message tying it together. Above all, fall décor is about the celebration of this transitional time, and the simplest items found in nature can transform your outdoor space. Taking your cue from nature’s gradual shift, add light to the space to enhance safety and energy for your outdoor lounging experience. Daylight savings will welcome longer nights on the porch in the evening hours, when it’s still warm enough to take in the night air. Consider lines of candlelight, lanterns, or rustic, exposed string bulbs to section off your space. Fire light or naturally warm bulbs will highlight the golds and earth tones throughout your décor. Sconces and outdoor-friendly lamps can come out for these darker weeks, welcoming family to read and eat on the warmer evenings. You may also consider adding touches of décor to your already existing sconces walkway lighting, creating a path of pumpkins or mums along the way. Every color, texture, and accent catches the eye of a visitor, immediately influencing how the space will make them feel. In the autumn, you’re looking to add warmth in order to balance out the growing chill in the air. It’s both fun and inspiring to think of different images that bring you warmth, both mentally and physically, and find subtle ways to work them into the space. Consider adding blankets with braided, thick textures to both tie in the color scheme of the space and to grab on a chilly evening. A stunning throw is also a great way to accent a new piece of outdoor furniture, shifting a fun wooden summer chair to a cozy spot to lounge in the fall. Stack additional blankets or throw pillows at the base of a two-tiered coffee table for when a large group gathers. Similar textures such as woven rugs, welcome mats, or indoor-outdoor mats add color and protect bare feet from the potentially chilly patio. Going a step further, consider circling your outdoor seating area around a fire pit or outdoor fireplace for ultimate hospitality and comfort. 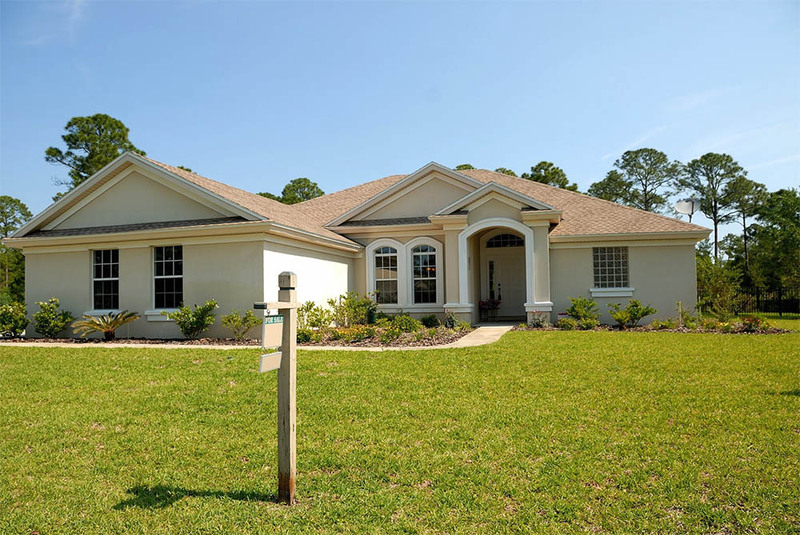 The range of options in this decision are as large as your imagination. Find a simple, diminutive chiminea or fire pit to complement your patio set, or consider hiring a designer to incorporate an outdoor fire place into your backyard in a more permanent sense. Adding a fire element to your outdoor space attracts everyone to gather outdoors throughout the fall, discouraging the usual distractions and making this a go-to spot to wind down and catch up. To fully prepare for chillier evenings, place heaters throughout the space so that each pocket of guests has a place to warm their feet. All in all, creating a warm space is about awakening the senses. Offer warm drinks to your guests as they put their feet up under a blanket, or relax with a book and a mug of tea for some quality down time. The moment we think of fall, the thoughts of warm spices, apples, and fall florals fill our mind. 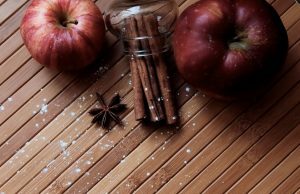 Consider balancing scents with fragrant candles, essential oil diffusers—perhaps of clove or cinnamon—or natural elements like fall roses or snap dragons. 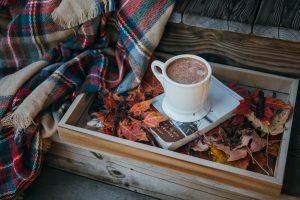 Infused fall herbal teas also enhance fall; you may even consider a spot for knitted tea cozies or mugs. DIY scented décor is an additional fun way to add a fragrance to the area. 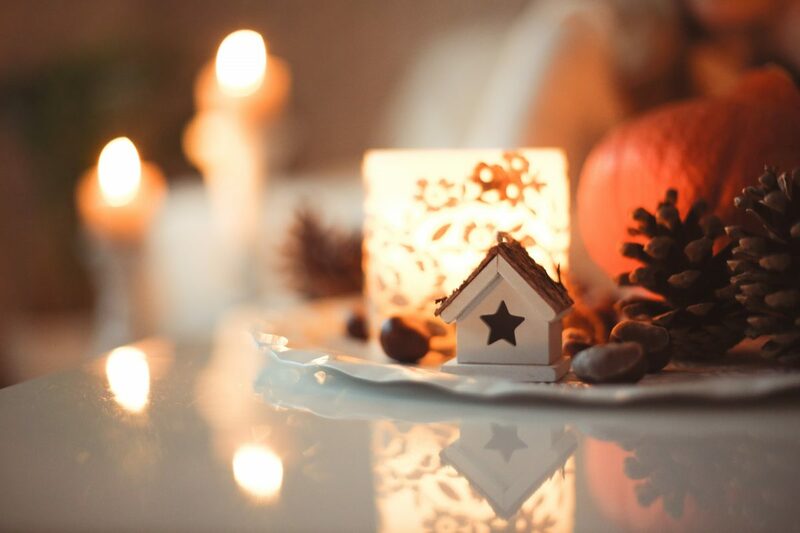 Roast pinecones in the oven with cinnamon and place them throughout the outdoor seating area for a scent of home. Scented items such as these can then be stacked and layered inside mason jars, lanterns or large bowls, serving as unique centerpieces or side table accents. Shifting to the cooler, shorter days welcomes a new sense of coziness and closeness. 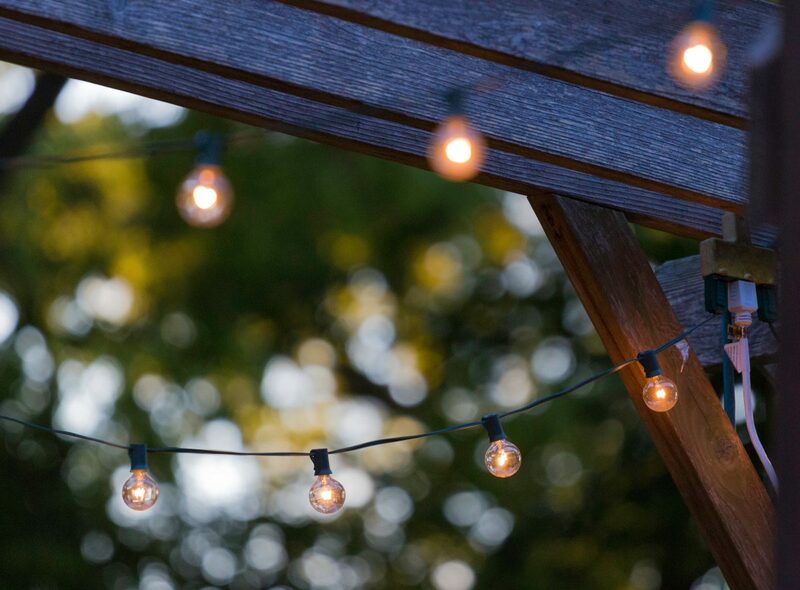 Though the signs of summer are shifting away, making an outdoor patio a welcoming place of calm brings even greater excitement to the coming holidays and fall season. But these décor changes can transform your outdoor space in the simplest and most personalized ways. Even slight shifts in each sensory experience creates a haven of luxury and relaxation.